Could you publish a full version of source code used in this article please? Send me your e-mail to msvaljek@gmail.com. I wouldn't do too many benchmarks with a RF 1 as it isn't what you'd use for a real setup. 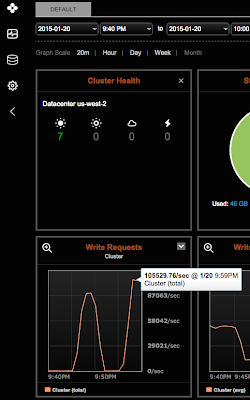 DId you look at cassandra-stress and try benchmarking the cluster directly? You are totally right. Replication factor 1 isn't the best for a real setup. With the replication factor 2 I got up to around 90k. That's a fair result too If we take into account that the amount of data in Cassandra is essentially doubled. I think that with the stress tool the performance results for the nodes would be significantly better. The goal was to generate real http requests, process them and store them. To be honest I ran out of resources on amazon and couldn't bring additional nodes up and had to cope with what I had.